While Home Box was out of the office, the ad men from Mad Men were working the Holiday. Thank goodness. CAUTION - SPOILERS. Episode 4 of Season 3 was one of my favorites in the ever-evolving Best Show on TV. First, Peggy's apartment search. It turned your stomach to see her bitter aging mother turn this into a personal affront. But it was hysterical to see her office-mates play a top-notch practical joke on her in response to her stilted roommate ad. My jaw dropped as one of the receptionists pretended to be from Teaneck, New Jersey - my hometown! There was the watershed moment with Sal and his wife. She knows she's not getting any "tending" but never dreamed why. Sal says it's stress about the crossroads in his profession, but ultimately she starts to see that he has different tastes. Sal got the gig on the Patio Cola shoot as the commercial director, a knock-off of the open of Bye-Bye Birdie. He was a little too effusive and effeminate when describing the cut to the negligee-clad Mrs. Romano. Ultimately, Sal's work was excellent but the Patio Cola people didn't go for it. The Sterling-Cooper brain trust was stunned that it failed and wondered why. Roger Sterling chimed in with his only line of the show "It wasn't Ann-Margaret." 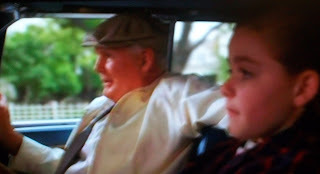 But the most underrated (and maybe most compelling) storyline was the building bond between 9-year old Sally Draper and "Grandpa Gene." Don's father-in-law is an eccentric, tough SOB, still recovering from a stroke but finding a best friend in his granddaughter. Just as he's starting to emerge as a breakout character, he drops dead at the A&P while buying fruit. In the aftermath, the family enjoyed some levity while discussing the arrangements. Sally was hiding, heard it, and she was outraged by their callousness. She was told to get back to the TV, to watch depressing news and even an early report of violence in Vietnam. That's something that Mad Men does so well, weave in the events of the turbulent, changing times of the 1960s as storyline plot points. But the Sally Draper character is clearly affected by this. She was always spunky (although a little chunky), but now you can see her developing into an out-of-control tween. 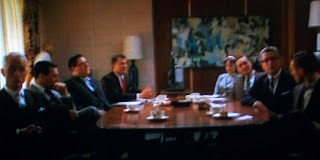 Outstanding work AMC, Mad Men is just too good to to take even a one-week hiatus.